We identify obfuscated gradients, a kind of gradient masking, as a phenomenon that leads to a false sense of security in defenses against adversarial examples. This paper investigates strategies that defend against adversarial-example attacks on image-classification systems by transforming the inputs before feeding them to the system. 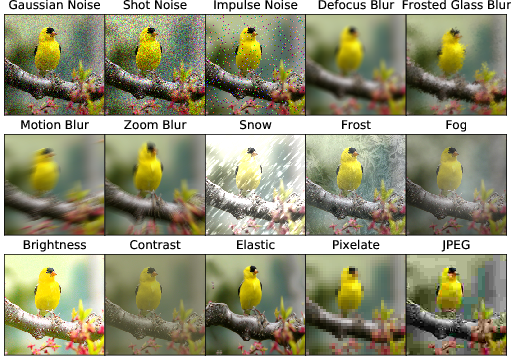 This study suggests that adversarial perturbations on images lead to noise in the features constructed by these networks. Recent work has demonstrated that neural networks are vulnerable to adversarial examples, i. e., inputs that are almost indistinguishable from natural data and yet classified incorrectly by the network. advertorch is a toolbox for adversarial robustness research. We present a training system, which can provably defend significantly larger neural networks than previously possible, including ResNet-34 and DenseNet-100. First, with HGD as a defense, the target model is more robust to either white-box or black-box adversarial attacks. Correctly evaluating defenses against adversarial examples has proven to be extremely difficult. Then we propose a new dataset called ImageNet-P which enables researchers to benchmark a classifier's robustness to common perturbations.